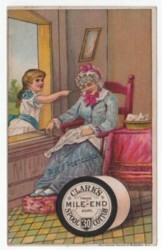 Dr. Thomas’ Eclectric Oil was a liniment formulated by Dr. S.N. Thomas in the late 1840s. Per Joe Nickel, a snake oil expert, it contained: spirits of turpentine, camphor, oil of tar, red thyme, and fish oil specially processed. 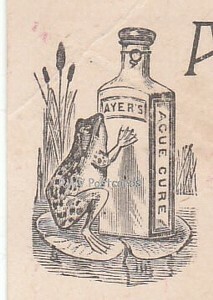 Dr. Thomas’ Eclectric Oil claimed to cure ailments such as toothache in 5 minutes, backache in 2 hours, deafness (?) in 2 days, and coughs in 20 minutes. Liniments are strong smelling, watery substances rubbed onto, not into, the skin to relieve sore and stiff muscles. Rubbing them on too vigorously has been known to cause blisters, since they contain skin irritants. Why would people be willing to put irritants on their skin? Think about it. Turpentine? Oil of Tar? Ben Gay is a liniment that contains many of the same ingredients as Dr. Thomas’ Eclectric Oil. I use it when I can’t stand a back ache anymore. It is my belief that pain has an amazing ability to get people to try cures they might not otherwise try if they knew what these so called “cures” were made of. Dr. Thomas homemade Eclectric Oil was a smashing success. 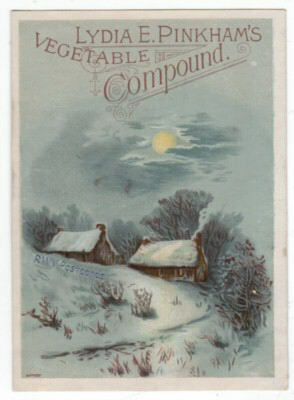 In the 1880s, he sold the name and formula to Excelsior Botanical Company. 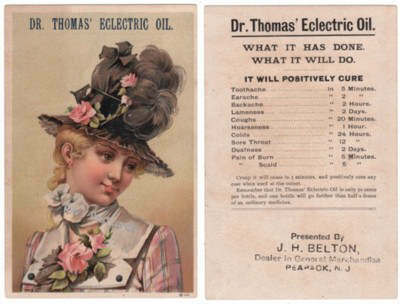 Dr. Thomas’ Eclectric Oil then appeared in the Farmer’s Almanac as Excelsior Eclectric Oil. 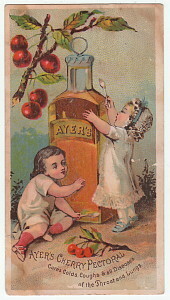 When Foster, Milburn & Co., of Buffalo acquired Excelsior Eclectric Oil a few years later, it was again marketed as Dr. S.N. Thomas’ Eclectic Oil. It became successful in both domestic and international markets. Northrop & Lyman, a Canadian pharmaceutical firm established in 1854, licensed the rights in Canada from Foster, Milburn & Co. 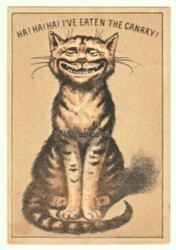 They sold literally millions of bottles of Eclectric Oil until the 1908 Proprietary or Patent Medicine Act was passed in Canada. 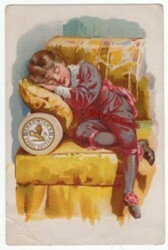 This law didn’t stop the sale of Eclectric Oil as it did so many other patent medicines. Nope. 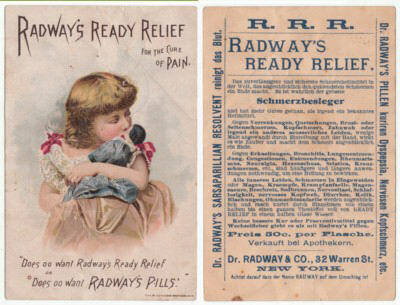 This liniment was sold right up until the end of World War II. 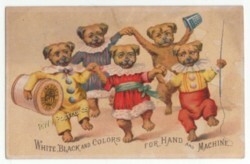 ** If you liked this blog post about Victorian trade cards, please lick on the bookmark button to the lower right. 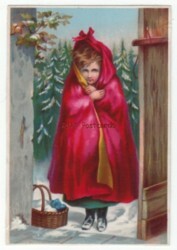 This afternoon, I opened my browser (to prepare a post on Victorian trade cards) to find the Yahoo headline: Snow in 49 states at one time. Cool (no pun intended). The lone hold-out was Hawaii, which coincidentally has a ski club (huh?). Snow in this many states is so strange, that stats are not kept on it. Trust the USA to be strange, lol. Kissing seems to be on many people’s minds these days. Not surprising as Valentine’s Day is just around the corner. 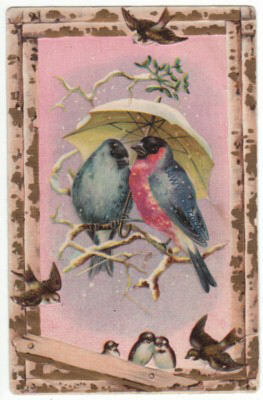 Victorian trade card lithographers did not appear to have kissing on their minds, however. 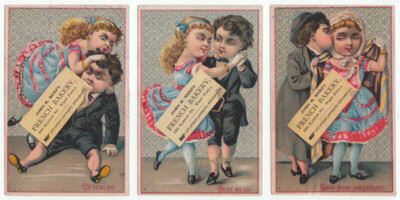 I have a stock of over 500 Victorian trade cards and only came up with three examples that showed kissing; two are below. 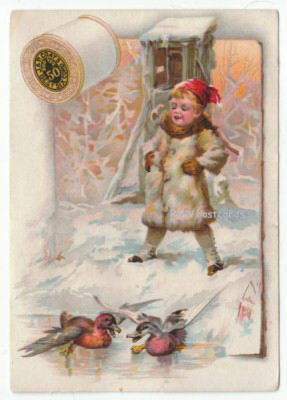 In the second example, the little girl is giving a kiss of comfort to her doll. 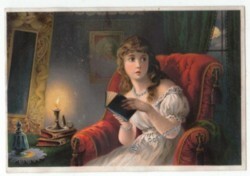 The lack of kissing on Victorian trade cards probably stemmed from the purpose behind them – the advertisement of something objective. Kissing is anything but objective. 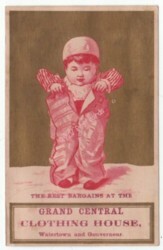 Victorian trade cards advertising for John B. Merz's French Bakery in Philadelphia, PA.
Patent medicine Victorian trade card advertising Radway's Ready Relief, Donaldson Bros. Lithographer. 34 facial muscles and 112 postural muscles are used in a kiss. An increased frequency of kissing in marital and cohabitating relationships has been shown to reduce cholesterol. Somehow I don’t think that was the goal of the kissing participants. 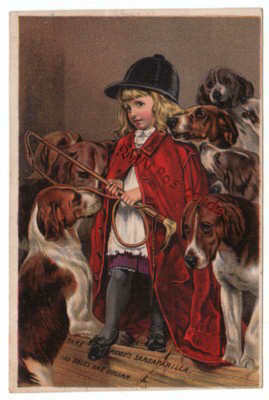 Many more examples of Victorian trade cards with great graphics can be found in my store, Remember When Vintage Postcards. * If you liked this blog post, please click on the bookmark button to the lower right. Sigh. I'm feeling a little old. You see, it's my 50th birthday today. I've decided to run away to a luxury resort and spa in Lake Geneva, WI instead. That way my daughter can't tease me about being an "old fart". And float down an indoor lazy river on an inner tube in the middle of winter. Ahhhh. What fun to have no responsibilities.